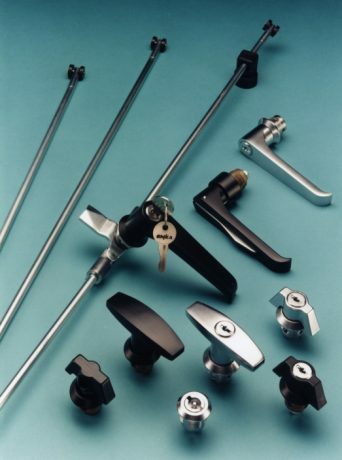 Locking systems are a significant area of cabinet functionality and cost. Consequently our rod locking system has addressed this by standardising on a single 20.1mm rounded square cutout and by use of an extensive range of compatible components. This minimises tooling, speeds punching and streamlines lock installation irrespective of type or size. 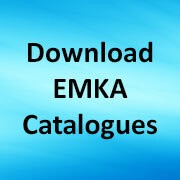 The EMKA cutout is a major factor in allowing a wide choice from this universal ¼ turn key/lock insert system, going from low profile insert or key locks directly to wing knob, T handle, L handle, padlockable handle or swing handle. This makes it easy for the specialist enclosure manufacturer to programme production for a simple door cutout and then to select a suitable lock/handle unit irrespective of door size or material. Based on a simple round rod system this programme offers a wide range of possibilities as well as flat rods and many different lock types. Single locks on small boxes, twin or triple point locking can all be achieved with the same lock cutout. With materials available covering the full range of applications – i.e. zinc die (black or chrome), black polyamide and stainless steel, no panel builder need be lost for a suitable locking system. Indeed the whole system, based on the standard 20.1mm rounded corner cutout is even flexible enough to cope with door thickness from less that 1mm up to 50mm acoustic panelling. By the simple expedient of standardising the interface between lock and cabinet we are able to offer one locking system for a whole area of enclosure production. Consequently specialist enclosure manufacturers can rely on simply picking what they need from this range to cover the majority of their locking needs for all industrial purposes. Share the post "EMKA rod locking makes it easy for specialist enclosures"